Bearly Fishing Slot Machine - Casino Answers! Bearly Fishing is a 5-reel, 25-line video slot developed by Microgaming, featuring a wild symbol, scatter wins, multipliers, a free spins feature, a gamble feature and a bonus game. You can play the Bearly Fishing video slot at Bovada. The Bearly Fishing casino game is a penny slot. 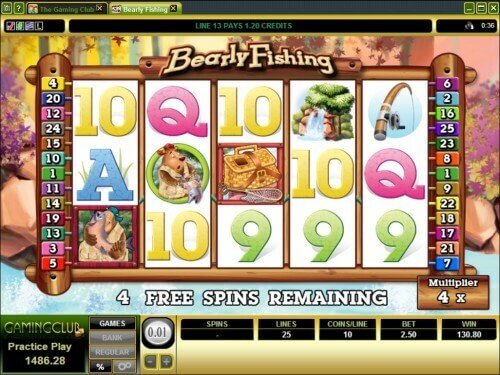 Coin values on the Bearly Fishing slot machine are $0.01, $0.02, $0.05 and $0.10. You can select up to 25 lines at up to 10 coins per line. The maximum total bet on the Bearly Fishing slot game is $25 per spin – a low betting range that is best for low rollers. 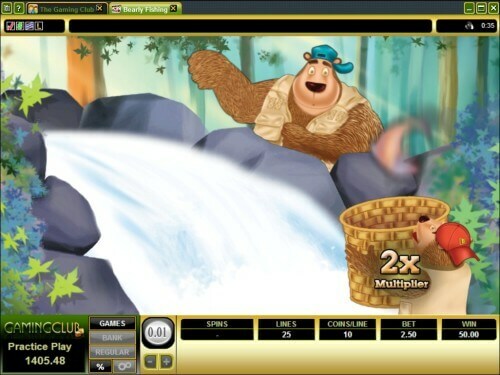 To play the Bearly Fishing video slot, select your bet and press “Spin” or you can use the “Bet Max” button. The top-paying symbol on the Bearly Fishing online slot game is the Papa Bear symbol. If you hit 5 Papa Bear symbols on a selected payline, you will win the 6000 coin top jackpot. The Papa Bear symbol is wild and will substitute for all symbols except for the scatter symbol. The next highest paying symbol is the Baby Bear symbol at 3000 coins. Other high paying symbols include the Waterfall (2000 coins) and Fish (1000 coins). Bearly Fishing has many great payouts. Use them to win big when you play at Bovada! After any win you get on the Bearly Fishing online slot, you can click the “Gamble” button to activate the gamble feature. You can either choose the card colour or card suit. If you guess the card colour correctly, you will double your win. Guess the correct card suit and you will quadruple your win. Press the “Collect” button to exit the gamble feature. You may gamble your winnings until the gamble limit has been reached. Payouts are made according to the Paytable. Payline wins are multiplied by the bet per line. Scatter wins are multiplied by the total bet. Scatter wins are added to payline wins. All symbols pay left to right, except for the Scattered Basket symbol (which pays any). Only the highest win is paid per selected payline. Coinciding wins on different selected paylines are added. The Papa Bear symbol is wild and will substitute for all symbols except for the Scattered Basket symbol. Bearly Fishing has an autoplay feature with advanced settings. To use the autoplay mode on the Bearly Fishing online slot machine, you must hit the “Expert” button. You can now play 5 or 10 autoplay spins. For advanced settings, hit the “AutoPlay” button and you can now play 5, 10, 25, 50, 100, 250 or 500 autoplay spins and stop autoplay if a win exceeds or equals $100, $500, $1000, $5000 or $9999. Autoplay will stop on any feature contained in the game. You can stop autoplay at any time on the Bearly Fishing slot game. There was something we really loved about Bearly Fishing – we just kept winning! Lots of wild symbols meant lots of wins when we played the Bearly Fishing video slot. You can get these wins too when you play today at Bovada! Can American players play the Bearly Fishing slot game? No, USA players cannot play the Bearly Fishing online slot. You can instead play many great online slots at Bovada. Where can I play other fishing slots? To play more fishing slots, you can read our list of fishing slot reviews. Can I play a Bearly Fishing flash game in my browser? Yes, you can play a Bearly Fishing flash game at Bovada. You can play for free or real money. If needed, update your version of Adobe Flash Player for best results at the flash casino.